A gala concert by the Festival guests is a regular feature of the Pärnu Music Festival. The year’s gala, July 20 at the Kontserdimaja (Concert Hall) in Pärnu, brought together 25 superb musicians. It was, in a word, a feast. Lutoslawski’s five aphoristic pieces, ranging from brisk and frisky to soulful and expansive, were given performances to match by violinist Kirsti Kuusk, violist Peijun Xu, cellist Andreas Lend, bassist Nikita Naumov, flutist Heili Rosin, oboist Riivo Kallasmaa, clarinetist Toomas Vavilov, bassoonist Peeter Sarapuu and French hornist Samuel Seidenberg. Clarinetist Matthew Hunt and bassoonist Martin Kuuskmann did the honors for Poulenc’s Sonata, giving it bounce, romance and a big dose of high-spirits. 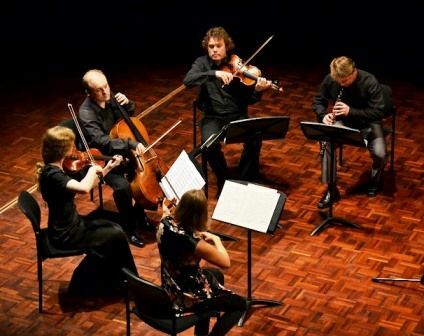 The horn quartet – Seidenbergs all and related (Samuel, Mirjam, Sulamith and Aaron) – brightened the evening with an Andante in D-flat Major by Bruckner (transcribed by Michael Höltzel) and “Evening Prayer” from Humperdinck’s opera Hänsel und Gretel. Their encore – a great deal of fun – was Fidele Grünröcke Marsch by Alfred Diewitz. The viola quartet – Mikhail Zemtsov, Julia Dinerstein, Dana Zemtsova and Andres Kaljuste, all fine players – did not fare as well in Bach’s Chaconne, sounding heavy and dark in contrast to the lightness and agility a solo violin can achieve. Violist Pejun Xu and cellist László Fenyö had a more congenial task in duos by Hindemith (his propulsive, spicy Duo for Viola and Cello), Beethoven (Minuetto from Duet with Two Eyeglasses Obbligato) and Mozart (Andante cantabile from his Duo for Violin and Viola, K. 424, arranged for viola and cello). Tubin and Brahms filled out the program royally. Tubin’s single-movement Piano Quartet – violinist Mari-Liis Päkk, violist Kaljuste, cellist Jason Calloway ad pianist Sophia Rahman – was well-played and romantic, with a dance-like conclusion. Brahms’ First Sextet, which followed, was one of the highlights of the evening. Violinists Arvo Leibur and Sandis Steinbergs, violists Mikhail and Dana Zemtsov and cellists Andreas Lend and Marius Järvi crafted the delicious sound in which it is drenched. This is warm, sunny Brahms, with a dramatic theme and variations (led off beautifully by Mikhail Zemtsov on viola), followed by a bracing Scherzo and a cheerful finale.